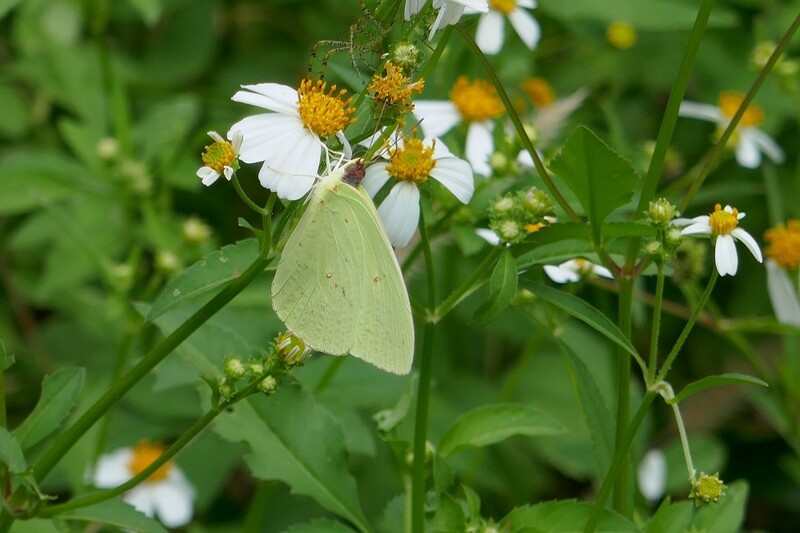 The cloudless sulphur butterfly, Phoebus sennae, is in the Peridae, or whites and yellows, family. It is a frequent visitor to butterfly gardens and if approached, will generally fly away quite rapidly. 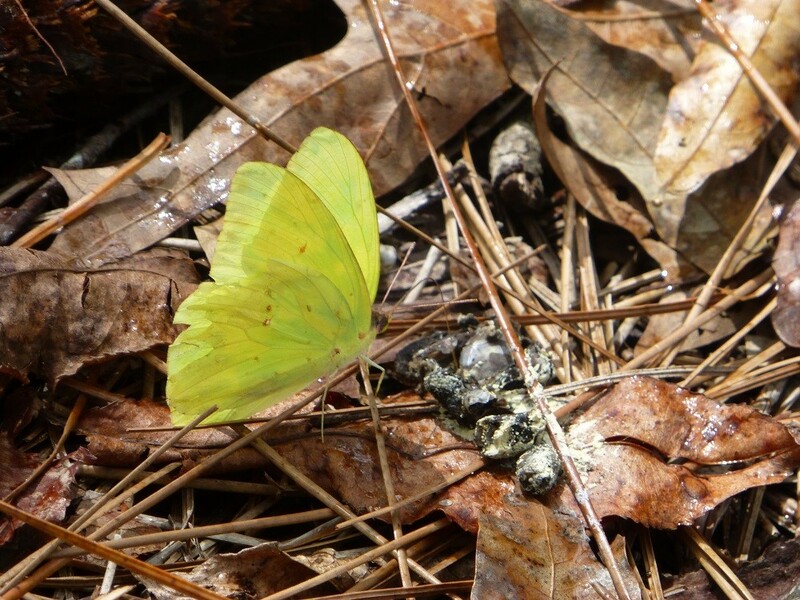 The cloudless sulphur is a reliable guest in my landscape, and its favorite flower color is red. It moves rapidly through the garden in search of nectar and larval food plants. If approached, it will generally fly for quite a distance before coming to rest. It is a rather large butterfly, 2 1/8 – 3 inches in size. The male is clear yellow above and yellow to mottled with reddish brown below. The female is lemon-yellow to pale yellow on both surfaces, with slight amounts of black markings along the wing margins. The eggs are yellowish-green, later turning red; laid singly on the underside of the leaf. The larva are green with bands of black bumps, and a lengthwise yellow stripe on each side. 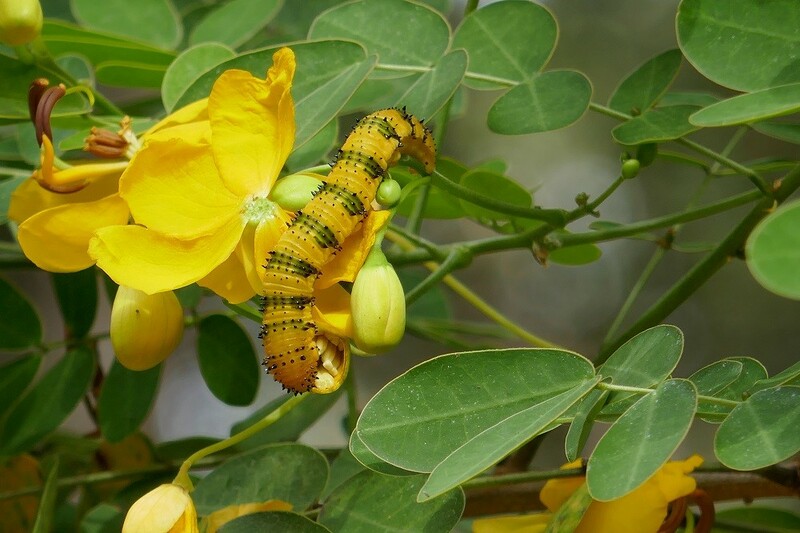 Coloration is variable and yellow larva may be found eating the (yellow) cassia blooms during the fall – affording excellent camouflage. The chrysalis is generally 1 1/4 inches in length, smooth, pointed at both ends and humped in the middle. Pinkish-green to green in color. Attached vertically to a branch with a silken thread. Some of its preferred nectar flowers are red sage (Salvia coccinea), coral honeysuckle (Lonicera sempervirens), scarlet morning glory (Ipomoea coccinea), standing cypress (Ipomopsis rubra), red savory (Calamintha coccinea), firebush (Hamelia patens), coral bean (Erythrina herbacea), cardinal flower (Lobelia cardinalis) and red pentas (Pentas spp.). At night and during stormy weather they tend to roost underneath the leaves of shrubs and trees that have rather large leaves, and especially leaves that are yellowing. 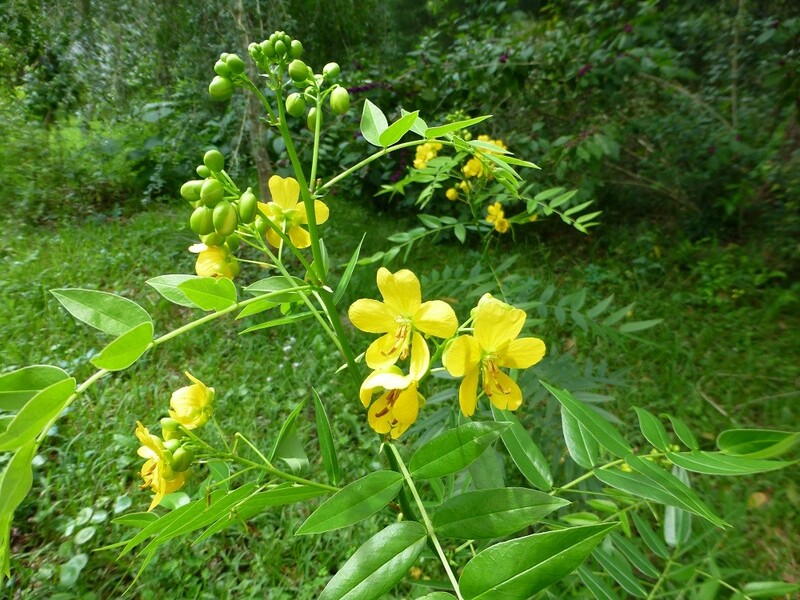 They are most prevalent in the fall and they usually crowd the roadsides and gardens.